The Smithsonian’s National Portrait Gallery has announced “Votes for Women: A Portrait of Persistence,” a major exhibition examining the history of women’s suffrage in the United States opening to the public on March 29. The seven-room exhibition will feature more than 120 portraits and objects spanning 1832 to 1965 that explore the American suffrage movement and the political challenges women have faced. “Votes for Women: A Portrait of Persistence” is a centerpiece of the Smithsonian American Women’s History Initiative called “Because of Her Story.” The initiative is one of the country’s most ambitious undertakings to research, collect, document display and share the compelling story of women. Its goal is to deepen our understanding of women’s contributions to the nation and the world. The Portrait Gallery exhibition tells this complex history through an array of early photographic portraits, paintings, engravings, works on paper, lithographs, video, newspapers, postcards, books, ballots, banners, fliers, a china set, embroidery and pennants. Viewers will be able to see authentic objects, including original banners from the National Woman’s Party, a late-19th-century ballot box and original writings by influential suffragists. “Votes for Women: A Portrait of Persistence” includes loans from a variety of prestigious institutions and is accompanied by a richly illustrated, scholarly catalog published by the National Portrait Gallery in collaboration with Princeton University Press. The catalog, to debut with the exhibition, is the first scholarly examination of the entire American women’s suffrage history in one book. Pelosi, Clinton and others speak at National Portrait Gallery’s “Votes for Women” Opening. The Awakening, 1915. Courtesy of Smithsonian Portrait Gallery. This exhibit will also shed light on the racial struggles of the suffrage movement and how African American women, often excluded by white women from the main suffrage organizations, organized for citizenship rights (including the right to vote). Portraits of SI-25-2019 African American contributors to the movement include Sarah Remond, who filed one of the earliest lawsuits protesting race segregation; Ida B. Wells, who advocated for federal laws against lynching; and Mary Church Terrell, who established the National Association of Colored Women. 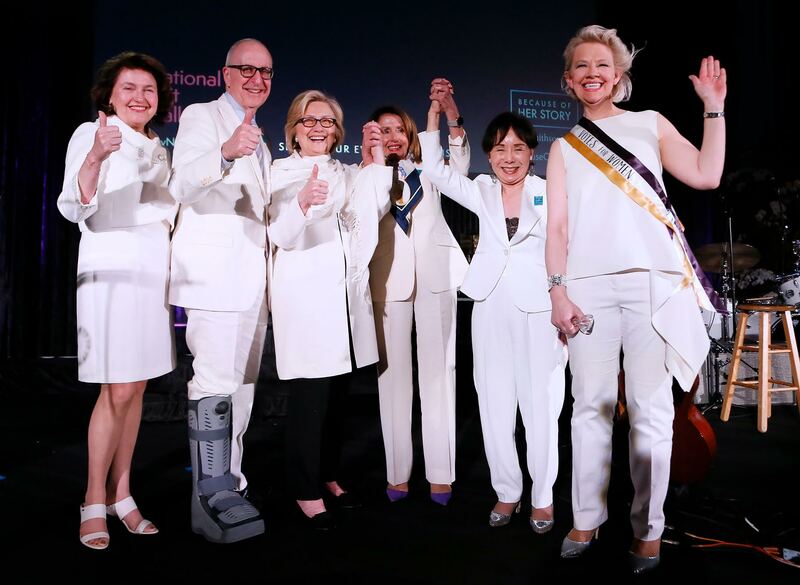 The opening evening took place on March 28, and paid tribute to the history of women’s suffrage in the U.S. and to women of leadership today who have made an impact on American history and culture. Smithsonian Secretary David Skorton, National Portrait Gallery Director Kim Sajet, Chair of the American Museum of Women’s History Congressional Commission Jane Abraham, Rep. Doris Matsui, former Secretary of State Hillary Rodham Clinton and Speaker of the House Nancy Pelosi delivered remarks, each sharing thoughts on a woman in history who has inspired them. Remarks were followed by a special tribute to the evening’s women of influence. The Smithsonian’s National Portrait Gallery tells the multifaceted story of the United States through the individuals who have shaped American culture. Spanning the visual arts, performing arts and new media, the Portrait Gallery portrays poets and presidents, visionaries and villains, actors and activists whose lives tell the American story. The National Portrait Gallery is part of the Donald W. Reynolds Center for American Art and Portraiture at Eighth and F streets N.W., Washington, D.C. Smithsonian Information: (202) 633-1000. Connect with the museum at npg.si.edu. ACTRESS MICHAELA MCMANUS COMES BACK TO NYC FOR NEW SHOW "THE VILLAGE"